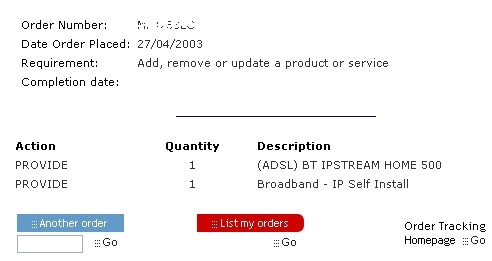 Some ISPs have their own tracking status tools that allow you to check where your ADSL order is up to, but many people do not realise that you can also check your order status with BT Wholesale. One of the things that you may notice whilst waiting for activation is loss of your phone line for 1/2 an hour to an hour whilst the BT engineer carries out the work on your line. You may have to wait another couple of days after this though whilst BT test your line. The following information may help you if you are waiting for your line to become ADSL activated, or check any orders such as an upgrade etc. First of all you need to have an account with BT which you can obtain for free from here. Use the "register" option at the top of the page. This allows to you check your online bills or make online alterations to Friends and Family etc. You will then be directed to the Order tracking: Landline orders page. The page should give you a list of any orders pending on your line. If you have problems with viewing an order number it may be because BT has inadvertantly included the last 2 characters twice - If so remove them to view your order. Thanks to demonuk for discovering that BT have moved this service to a new url under the business section. This account allows you to look at your telephone bills, and administer such things as friends and family online. ~ The phone number should include the full area dialing code and not include any spaces or brackets. ~ Your customer number can be obtained from your telephone bill and will be in the format of AA00000000 where 'A' are letters and '0' are number. Discard any spaces, and letters after the 8 numbers. *Note: Information input into this form is not collected, stored or recorded in any way by this site. This checker will take you to the relevant BTWholesale results page. It then will show your account number. Now you will see your order number.